Anora Skincare is a new line of products designed to reverse the signs of aging through the use of natural ingredients infused with scientific breakthroughs. This revolutionary product line erases the signs of aging with new technology to create skincare that goes deeper to deliver youthful results, minimizing lines and wrinkles while retraining the skin to function as it did in the prime of its youth. The result is an unparalleled skin treatment that reveals radiance and youth in no time! Anora Skincare was developed by the founders of DermaGlobe, Inc. in conjunction with Dr. Charles A. Leroy, M.D., a Georgetown University School of Medicine graduate with a specialization in Molecular Biology, and an elite R&D team. Using the combined experience of the entire team, the product line was created and perfected to ensure the most revolutionary ingredients and technology were utilized in each product. By focusing on the desires of consumers, Anora Skincare was born and bred to deliver impeccable results on aging skin, restoring its vibrant and youthful qualities. 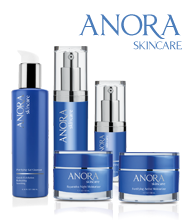 The Anora Skincare product line includes Fortifying Active Moisturizer, Reparative Night Moisturizer, Advanced Renewing Eye Cream, Anti-Aging Serum, and Purifying Gel Cleanser. The nature-based scientific ingredients used in the formulation of this product line were designed to bring dramatic anti-aging results that defy the hands of time. Among them, MariMoist®, “Aloe from the Sea,” hydrates, cool and soothe skin. Neossance® Squalane provides improved elasticity of skin while delivering intense hydration while strengthening the skin’s barrier and reducing the appearance of fine lines and wrinkles. Along with proteins, allantoin, and vitamins A, C, and E, skin texture and luminosity is restored and collagen synthesis as well as skin renewal. This extraordinary blend of ingredients makes Anora Skincare the new fountain of youth. Anora Skincare, pharmaceutical-grade, and provides 4x the amount of active ingredients compared to other skincare products.